I just wanted to throw this out there because it worked incredibly for me and I want to spread the love! I’ve used the Aztec secret healing clay masks a couple of times and have generally felt ‘meh’ about it. I felt dry and tight and then broke out the day after. So…when I tried my most recent mask, I applied as normal but then, after taking it off, I used pure argan oil to do an oil cleanse. I looove touching my face so I always relish in this an ended up massaging for 10 minutes. I kid you not, I think I got 200 pieces of grit out in 10 minutes. Now, my skin feels amazing, my pores are nearly invisible in most places (used to be huge and gaping and scary), and my face feels alive. 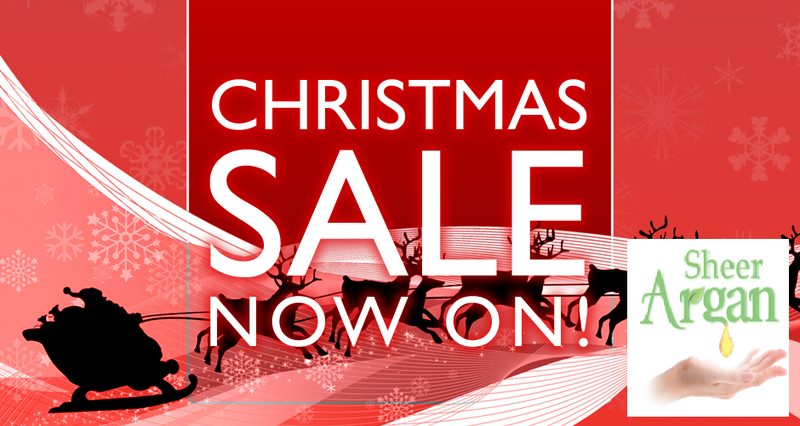 Get a head start on New year’s shopping by checking out our after-Christmas sale and year-end Offer on pURE arGAN oIL. Hope you are all well and enjoying the run up to Christmas, Christmas time is the way cities are decorated with Christmas lights and Christmas trees and all things pretty. although I feel that this is the time that some of us can truly lose the spirit of Christmas.when we allow our stress levels to arise all in the name of materialism. I just read an entire article on argan oil and I wish I read it sooner because argan oil is amazing. I’m actually going to do an entire write up on argan oil now because I never knew how great this oil was. One notable effect is that it can inhibit melanin to help treat Post Inflammatory Hyperpigmentation. 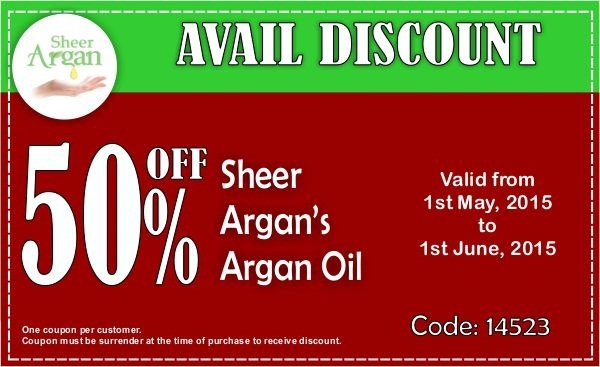 *NEW* High Value 50% OFF Argan oil Coupon. 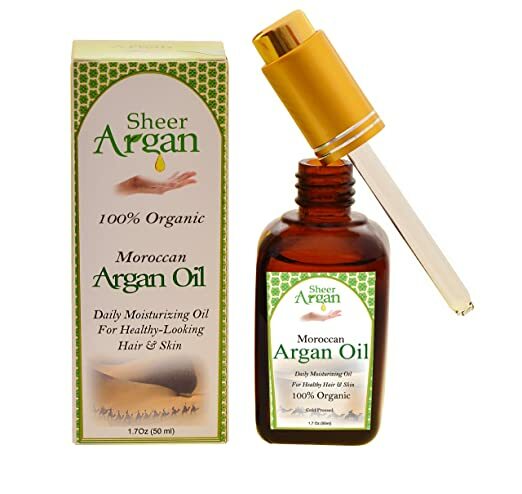 I absolutely Sheerargan pure Morrocan argan oil. The company following fair trade practices, 100% Argania Spinosa (Argan Oil), cold pressed imported directly from Morocco by a Moroccan living in Lehigh Valley, Pa.
Print this coupon and send it to info@sheerargan.com on placing order for Sheerargan oil oR USE code 14523 on purchasing online via website www.sheerargan.com. You will get Pure argan oil bottle 50% OFF. [Guest Post] Softest/Smoothest my hair has ever been!! So I recently started going to a new stylist, and after the first trip I asked her what she used to make my hair so soft and she said argan oil. Here is a picture of my hair btw. I know I have a few fly away’s from blow drying my hair so much, but look at how smooth that is!!!! So I bought this brand. It has worked wonders on my long, damaged hair!! My mom said it looks like I just stepped out of a Pantene commercial!! I use it on my towel-dry hair after showers. I just squirt two drops into my hand and run my fingers through my hair. I blow dry immediately after and my hair is amazingly smooth!! Sorry if this seemed like a commercial for hair products, but I just had to share!! If you’re thinking about an organic natural hair oil for hair problems, and you want to smooth or soften your hair, I give pure argan oil a thumbs-up. it is also sensitive to heat. It should not be heated after or during processing, since this breaks down some of the substances responsible for its effects. You want cold-pressed. Argan oil intended for cooking isn’t going to work as well for hair or skin, since the seeds are toasted before being ground up. It’ll have a much stronger smell and be heavier. You only need a teeny-tiny bit. My hair falls just past my shoulders and I use about four or five drops (and rub the excess into my cuticles). You can apply it before a shower (give it an hour or so) or after. 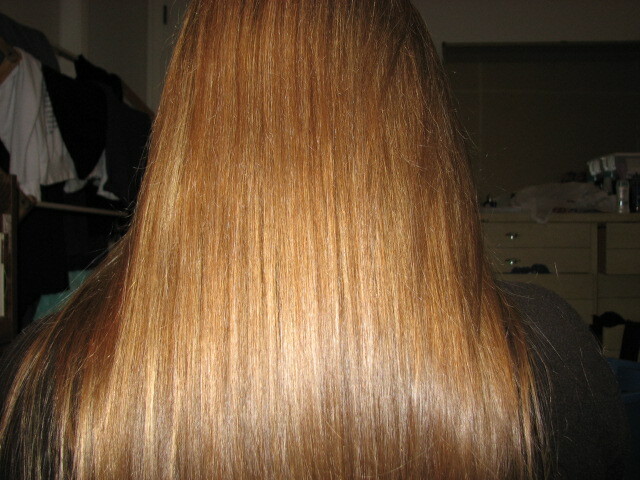 If it weighs your hair down, I would apply it before so you can rinse out excess. Be careful if you are trying to go ‘cone free: lots of products that advertise argan oil as a solution for frizziness include silicones as well. Apparently this stuff has a very high proportion of fatty acids that are particularly good for hair (linoleic and linolenic fatty acids). I’m still checking out the properties of other oils but argan seems to hold up pretty well against other popular ones like shea butter and coconut oil. Argan trees are not especially attractive. Twisted, thorny and gnarled, these scrubby trees thrive in near-desert conditions of the Souss and Haha Valleys in southwestern Morocco. Since ancient times they have endured the harsh climate there, the only area in the world where they grow. The tree likely originated in Argana, a Berber village on Morocco’s Atlantic coast, from which it takes its name. An area of roughly 175 square miles between Essaouira and Guelmim supports 21 million of these trees that are an important economic and environmental resource for the region. The number of trees is now declining so preservation efforts are underway to protect this unique, endangered resource. Typically measuring 15 – 20 feet in height, argan trees are robust and require no cultivation. They are long-lived, often growing for 150-200 years, and able to survive drought due to their deep root system. Argan trees have been known since the time of the Phoenicians in 600 B.C. The tree produces fruit that is green and fleshy, much like olives, but larger and rounder. Inside the fruit there is a nut with an extremely hard shell that, in turn, contains one to three almond-shaped kernels. What is Moroccan Argan Oil Good For?